Shopping in Taobao is currently the IN thing for online shoppers like me! Taobao.com is a china online shopping platform which sells all sorts of items! You can find Clothing, Shoes, IT Products, Household Products, Sports Items and many more. You name it, Taobao has it! Of course the prices listed in Taobao are so much affordable, cheaper than what you can get in Singapore. They have the latest Japanese & Korean trend of Fashion Items and even the latest IT products which you may not find in Singapore retail stores. I have once tried direct purchase from Taobao.com but unfortunately the purchase did not go through successfully. I didn’t know that some of the vendors in Taobao.com do not ship internationally, I paid the items via my credit card. Checked the status for many weeks, it’s always “processed”. I sensed something is not right so I contacted the vendor, after which they told me they do not ship internationally and will process a refund for me. I felt so cheated, how come they didn’t inform me when they received the order. Only after a few weeks, I contacted them, then they told me they can’t process it. After this incident, I told my friend about this issue and asked her how does she shop in Taobao? 65daigou is the 1st and No.1 Singapore local registered company specialized in overseas (China, Taiwan & USA) purchasing, logistics and international shipping. Comparison between Taobao.com direct and 65daigou. In conclusion, 65daigou is the best choice shopping in Taobao. It’s fuss-free and trustworthy agent for all our purchases! So how do we shop via 65daigou? Step 1: Access Taobao.com (you don’t have to create an account for browsing). Step 2: Start searching for the items you want to buy. You may type the keyword of the items you want to look for on the search box or browse through the categories on the side bar. Although Taobao.com is in Chinese, you may search the item in English words, the search box will auto appear some suggestions upon your keywords. Step 3: Results appeared, you may start browsing and shopping for your items. 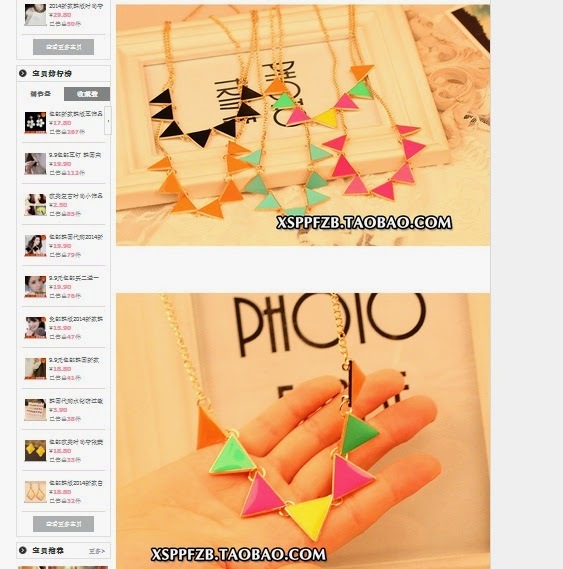 If you can’t find anything you like, taobao will list some popular searches and suggestions for you. Step 4: Clicked on the item you interested with, the item page will gives you more detailed info and pictures. 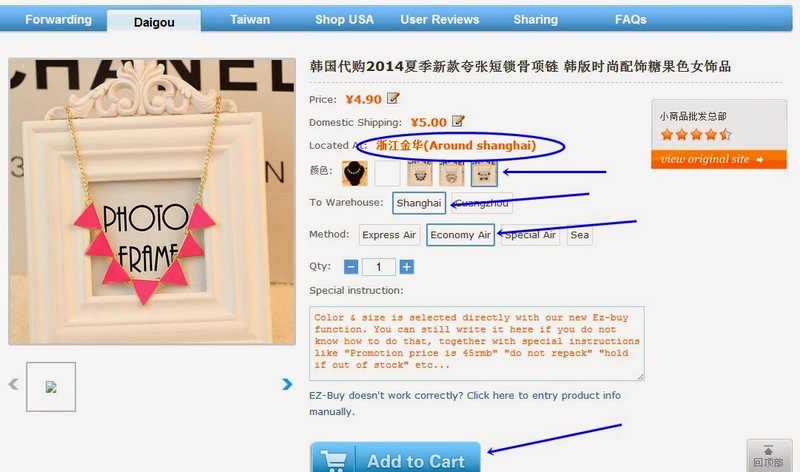 *Tips: Some taobao vendors may sell the same items at a cheaper price, you may do a search on the item itself to check out other vendors’ selling price. Step 5: Now access 65daigou.com and register for an account. 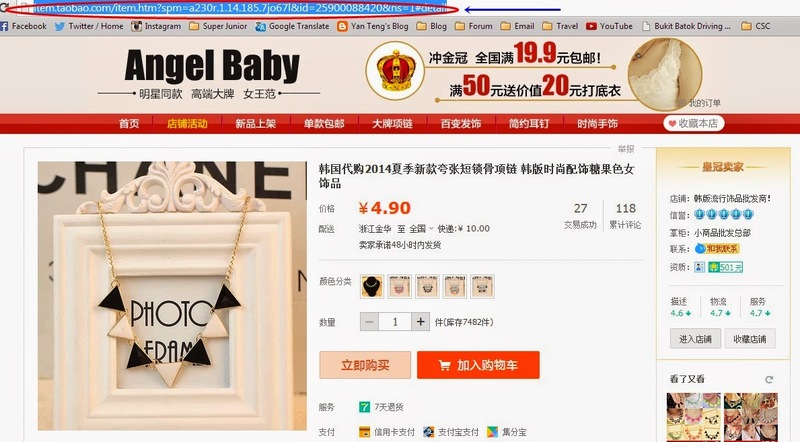 Step 7: Paste the URL link on 65daigou.com site under the EZ-BUY box and click on EZ-BUY button. Step 8: 65daigou will generate out the item page on it’s site. With the new EZ-BUY function you can now choose the colour, size of the items on 65daigou website itself. Previously, we have the type the colour and sizes of the items we want on the remarks box. Do remember to click on the warehouse where you want the item to ship to and method of shipping to Singapore warehouse. The new EZ-BUY function will tell you the location of the vendor is so you can decide whether to ship to 65daigou Shanghai or Guangzhou warehouse. So which shipping method to Singapore shall we choose? The shipping charges are based on the parcel weight, size and method. If you are not hurry in getting your items, Sea Shipment will be the most economical method. For me, I don’t want to wait for so long and don’t mind paying a little more, I always opt for Economy Air. 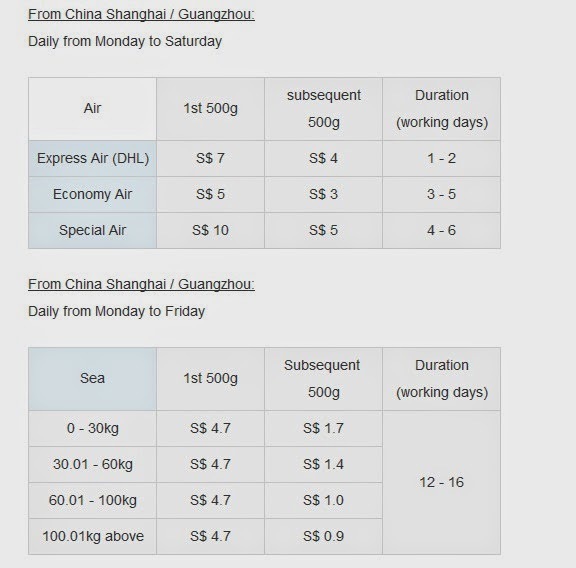 Here are the charges of various shipping methods in 65daigou. Step 9: Continue shop for other items in Taobao.com, once you have finish added all the items into the 65daigou cart. You can check on the Shopping Cart for all your items you have added. The sub total will tell you the amount in SGD and check if all the items are ship to the same warehouse. *The total amount stated at the bottom is for the total price of all items does not include the shipping and agent fees. Do remember to consolidate all the items you want to buy in 1 order. DO NOT ship each item individually, it will cost you to pay more in the shipping fees. Step 10: After checked out, the summary page will displayed all your items again and also your remaining MyPrePay account amount. My PrePay is your 65daigou account, you have to top up money to the account via ibanking or paypal to pay for your items in your shopping cart. You can see I have $14.71 remaining in my account from my previous purchase in 65daigou. Step 11: After clicked on Pay Now, it will direct you to the page where you have to top up your PrePay account. There’re a few options to top up your account. There’s no extra charges for Internet Banking & ATM Transfer but for Credit Card there’s a 3% transaction charge and Pay Pal there’s a 3.9% + S$0.5 transaction cost. Step 12: After Payment is successfully paid. Click on “My Order” on the side bar and check the order status. Now let’s wait for the items to arrive their Shanghai Warehouse. I will follow up on another blog post when my items arrived at 65daigou Shanghai warehouse and procedures on collection of the parcel! Start your shopping spree at Taobao and place your order via 65daigou now!